Win 1 of 5 Noble's Pureau SIGG water bottles! Green is the new black. Or so they say (although I'd bet Anna Wintour would beg to differ). Living as greenly as possible is de rigeur nowadays. Carbon footprint is to us now what Global Warming was 20 years ago. The smart people at Noble's Pureau have come up with another way to enjoy water as an alternative from the dreaded plastic water bottle - water from a 5 or 10 litre cask. 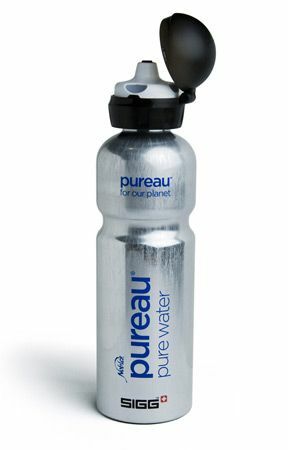 Noble's Pureau is also the only water 100% guaranteed to be completely free of chlorine, bacteria, fluoride, sodium and other impurities that are so prevalent in both tap and bottled water through their 3 step filtration process. Their cask is also enviro friendly with 2 out of the 3 cardboard layer being made out of 100% recycled material and the entire cask and bag materials being recyclable. Along with the cask packaging, they also have their own Noble's Pureau SIGG water bottles designed to be used in conjunction with the 5 or 10 litre casks. So this month, thanks to the kind people at Noble's Beverages, we are giving away 5 Noble's Branded SIGG water bottles. These ingeniously designed reusable bottles are worth $35 each and they're a fantastic way of reducing your dependance on water bottles and not only that, they incredibly durable and chic. Whilst SIGG bottles are more expensive than the average water bottle, they last for years and have a non-toxic internal liner that protects the water from any taste transfer so your water tastes exactly like it should. Theyre also easily washable, so you can ensure that the bottle is kept clean and bacteria free at all times. All you have to do is tell me in 35 words or less, how else have you, or do you intend to, reduce your carbon footprint? * Add your entry via a comment to this story. You can enter _once daily as long as your entry is different each time _and t*his competition is open to Australian residents only. The competition ends midnight AEST (Australian Eastern Standard Time) on Sunday the 2nd of November so you have plenty of time! Of course if you can't wait and want to buy one of these yourself, you can purchase them at the Noble's Pureau website here. The casks are available at all major supermarkets. featureNQN competition: Cocolo Organic Fairtrade Chocolate Giveaway! featureWin 1 of 10 Double Passes To Dilmah's Charitea High Tea Event! featureWin 1 of 35 Anathoth Brunch Packs! featureWin A $150 Meat Voucher at Haverick's Direct! featureWin a $150 Lunch For Two at Nielsen Park Beach House Cafe, Vaucluse! featureWin 1 of 5 Copies of Mezza Italiana by Zoe Boccabella! featureWin a set of revolutionary Mayfair Lane Stationery! restaurantWin 1 of 10 Double Passes to See Michelin Chef Documentary Theatre of Life! feature NQN competition: Cocolo Organic Fairtrade Chocolate Giveaway! feature Win 1 of 10 Double Passes To Dilmah's Charitea High Tea Event! feature Win 1 of 35 Anathoth Brunch Packs! feature Win A $150 Meat Voucher at Haverick's Direct! feature Win a $150 Lunch For Two at Nielsen Park Beach House Cafe, Vaucluse! feature Win 1 of 5 Copies of Mezza Italiana by Zoe Boccabella! feature Win a set of revolutionary Mayfair Lane Stationery! restaurant Win 1 of 10 Double Passes to See Michelin Chef Documentary Theatre of Life!